Boxing. A hard little word. When you think about it, what images does it conjure up in your head? Muscular men, bloody lips, cuts and bruises? Or do you see strength, power, respect, resilience and stamina? Growing up, it was very much a masculine sport. Real men, the tough guys. I remember sitting cross legged in front of the tv, at a family friend’s house, watching Frank Bruno swing his massive paws. Grimacing at the Holyfield vs Tyson fight, as Mike took that infamous bite. Eww. It was the 90s. I was in my pre-teens – probably inspired by one of those big tv fights, when I suddenly got the idea in my head that I wanted to try boxing. Nervous, but feeling excited about taking on this new sport, I headed to the Warrington Amateur Boxing Club at Hard Labour Gym. It’s probably worth noting that, prior to this move, my dancing career had just been cut short, fairly sharpish, after an excruciatingly embarrassing incident. complete with wing-like arm movements and bobbing heads – the only older kid, whilst my friends were all busy learning the River Dance… Oh the shame! Unfortunately, I was told, upon entering the boxing club as an 11 year old girl, that because I was still so young (read as: not quite developed yet in the chest area) I wouldn’t be able to box. I was gutted. Anyway, fast-forward a good 20 years and I’ve made up for that slight setback… and have since tried my hand at Boxercise, at my local gym. Which I absolutely loved! 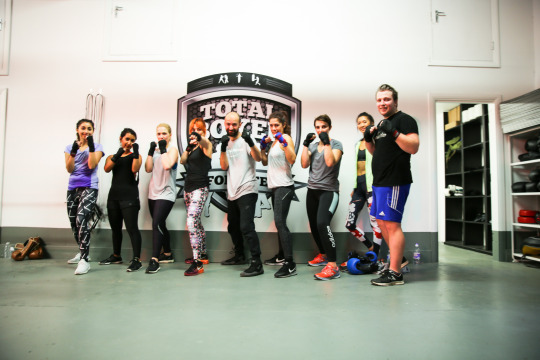 More recently, I was invited to North London’s Hornsey, to check out a couple of brand new fitness classes at Total Boxer: Get FIT Not HIIT™ and BoxingYoga™. 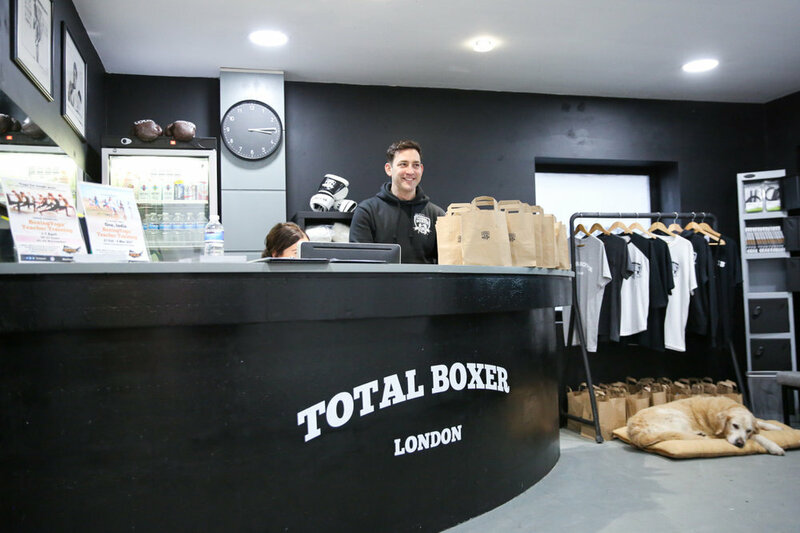 Total Boxer Founder, Matt Garcia, now has two North London clubs – opening the second one recently, to satisfy the increasing demand for classes. They offer a wide range of classes and training, without pomp or ego. Their team of trainers make you feel incredibly at ease from the moment you step foot inside the door… and their custom-made boxing ring. 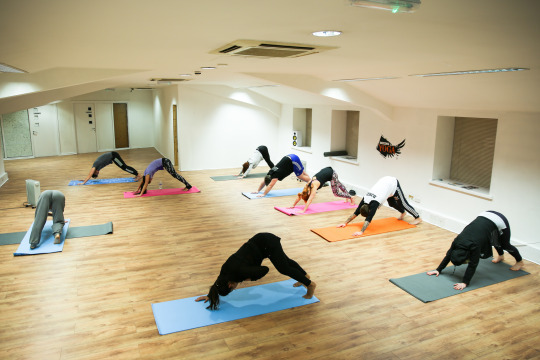 With a membership base comprising of 50/50 male and female members, it’s great to see that more and more women are opting to exercise in this way. There’s something incredibly empowering about training in a way that makes you feel strong, both mentally and physically. And no, you don’t have to worry about getting a black eye! 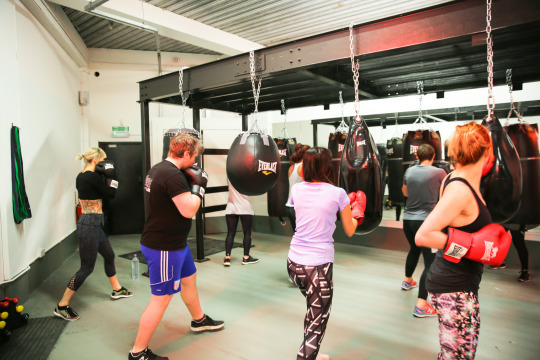 A typical Get FIT Not HIT™class will put you through your paces, help you lose weight, increase your level of fitness, improve overall conditioning, massively build confidence, de-stress, learn self-defence and most importantly, develop total body strength. “Through guided rope-work, shadow boxing, pad-work, bag-work, including the ever-popular speed ball, boxer-style circuit training and plenty of encouragement from excellent Total Boxer coaches, we’ll help get your mental state and physical shape to a whole new level, while learning the true craft of a fantastic, fun and challenging sport. What does a typical 60-minute Get FIT Not HIT™ class usually involve? 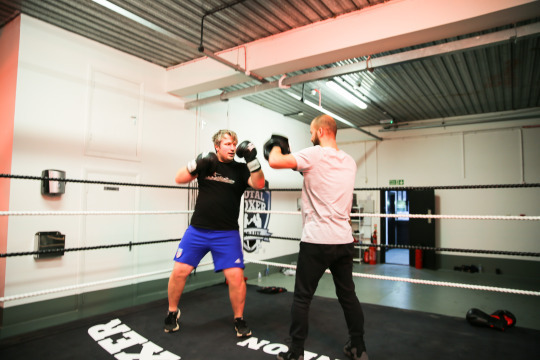 After enjoying the class so much, my friend Patrick and I were quizzing Matt and his team as to whether they’d be opening a Total Boxer in West London, closer to where we live… Watch this space! 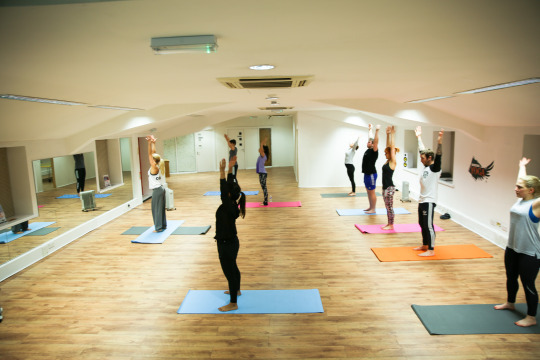 HIIT class done, we headed upstairs to the brand spanking new BoxingYoga studio, with our yoga teacher Kajza Ekberg. We were intrigued to see if two so very different forms of exercise could actually be elegantly combined into a decent workout. 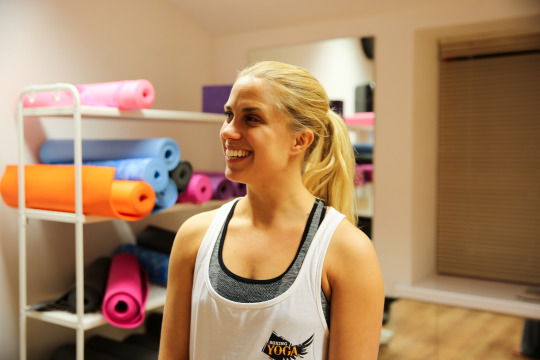 Kajza also teaches BoxingYoga to The Saracens rugby team– so if it works for them, I reckon it can work for us normal folk too. It’s perfect for athletes, fighters or anyone with an active lifestyle who wants the benefits of a mental and physical workout, by stretching and strengthening the whole body. The result: It was bloody tough! 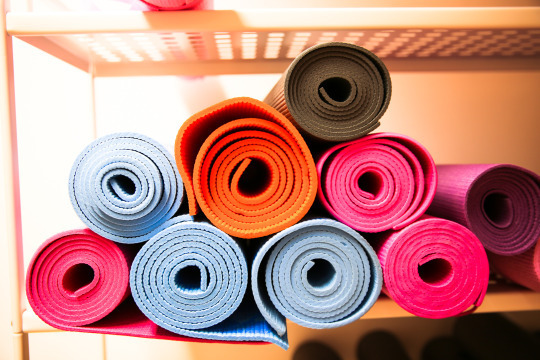 Yoga, contrary to popular belief, is not for wussies – and when mixed with boxing… Jeez! The pain etched on Patrick’s face as he tried out a back-bend for the first time was difficult – but quite very funny – to witness. Sorry, Patrick. 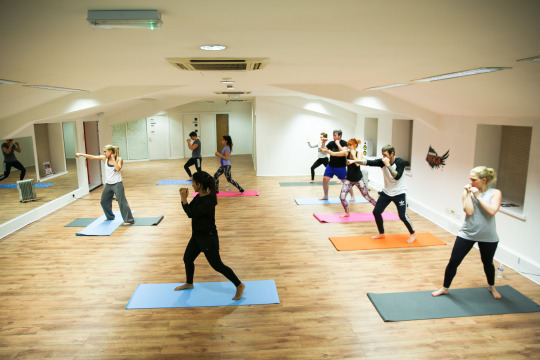 We found the 60 minute BoxingYoga class challenging but thoroughly enjoyable. I’d definitely love to do another. I left the class feeling really zen, but with the satisfying ache (for the next two days) knowing that I’d been worked really really hard.